If you're not a fan of spicy food ... become one. Now, I'm not saying you need to become an addict like me. But it's just so healthy for you. Plus it gives you variety! 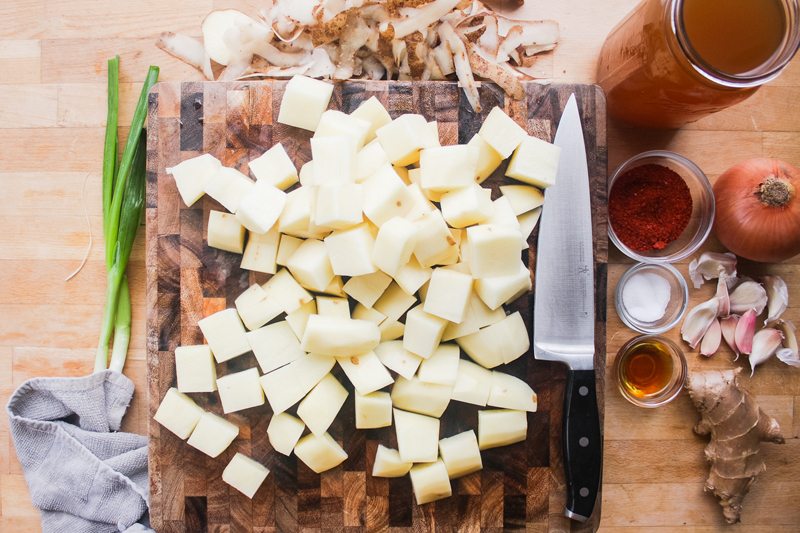 Food can't be boring with a dash of chili flakes. Or spoonfuls in this case. Peel then cube the potatoes to about 1 inch pieces. 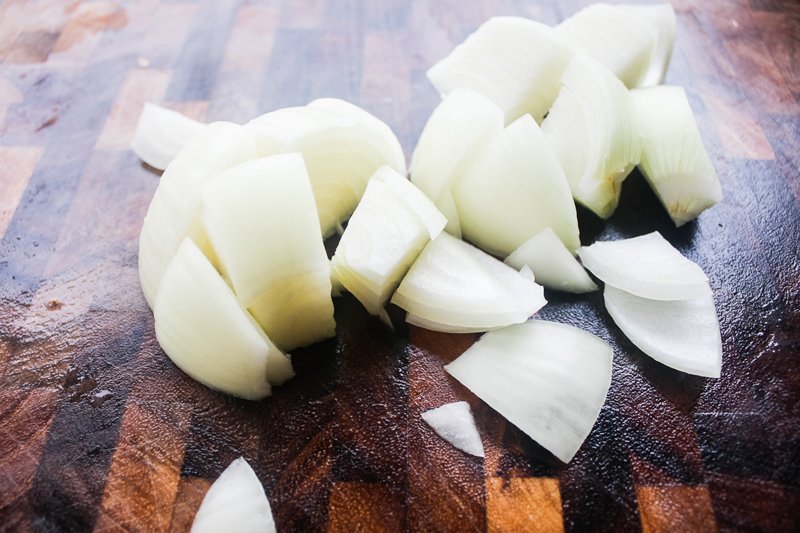 Peel then cut the onion in half, then cut into rough 1/2 inch pieces. Peel then grate the ginger. 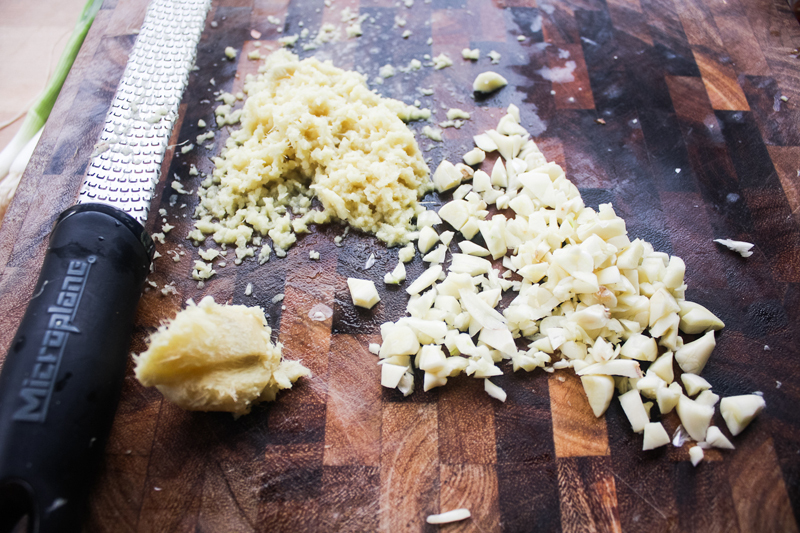 Peel then mince the garlic cloves. 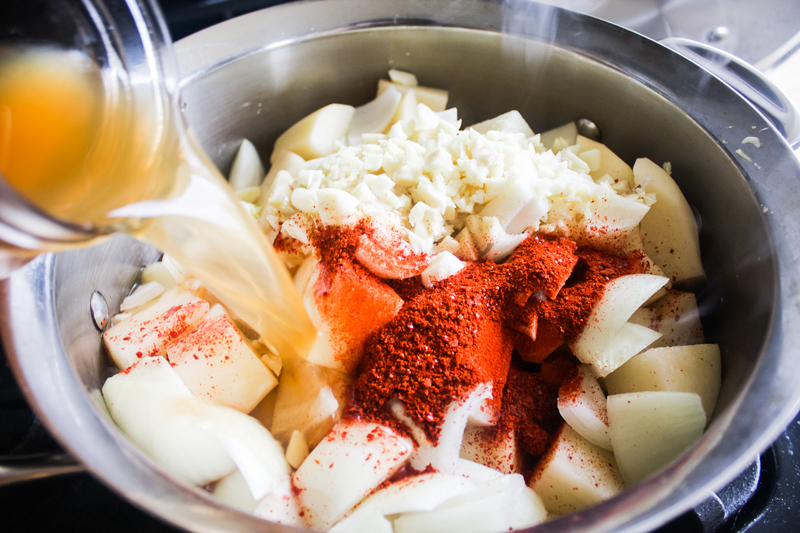 In a medium sized pot, add the potatoes, onions, garlic, ginger, gochugaru, and salt. Pour in the vegetable stock. If needed, add water to cover everything in the pot. Turn the heat to high then bring to a boil for about 20 minutes. While the stew is boiling, cut the green onions into small pieces and set aside. 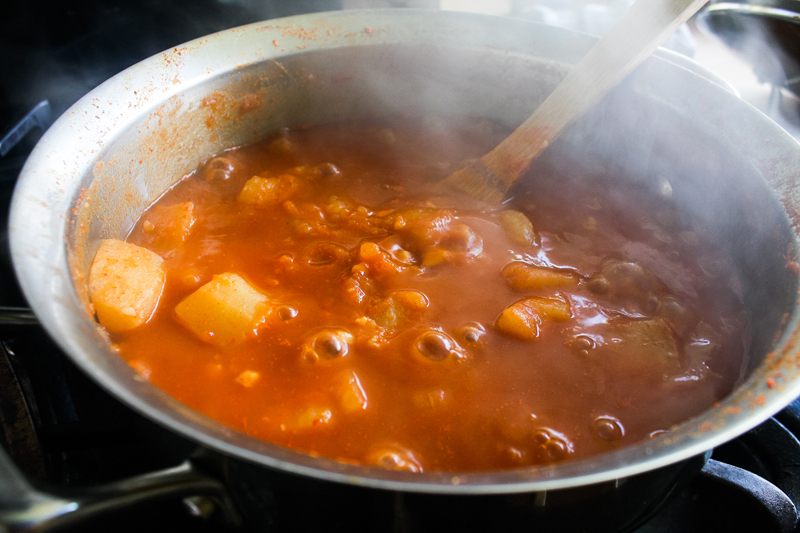 Bring down the stew to a medium heat and stir to prevent any burning. Continue to occasionally stir and keep at a low boil until potatoes are really tender, about 20 more minutes. Let the stew slightly cool down, top with green onions, and drizzle with sesame oil. Kimchi fried rice is a staple in my home. With an occupancy of two and a half - the half being of the canine variety - I sometimes make too much rice. I can feel "the look" from the husband as I'm typing this ... so let's replace sometimes with always have and always will. We're friends, so let me give you some advice: never throw away leftover cooked rice. There's no reason. You can add it into soup, maybe mix a bunch of chimichurri with it, and most importantly, you can make bokkeumbap. This dish just so happens to go together beautifully with the soy sauce ginger chicken I made in the last post. And I know what you're thinking. Where the heck is the egg on top?! While I also adopt the #putaneggonit philosophy, when it comes to real home cooking, I don't always feel the need to make my dishes how they're photographed on the internet. Especially since we didn't always have a perfect sunny-side up egg served on top when I was a kiddo. I'm goin' old school.